Cadbury’s Creme Eggs. How do you eat yours? If you’re me, the answer is not very often. 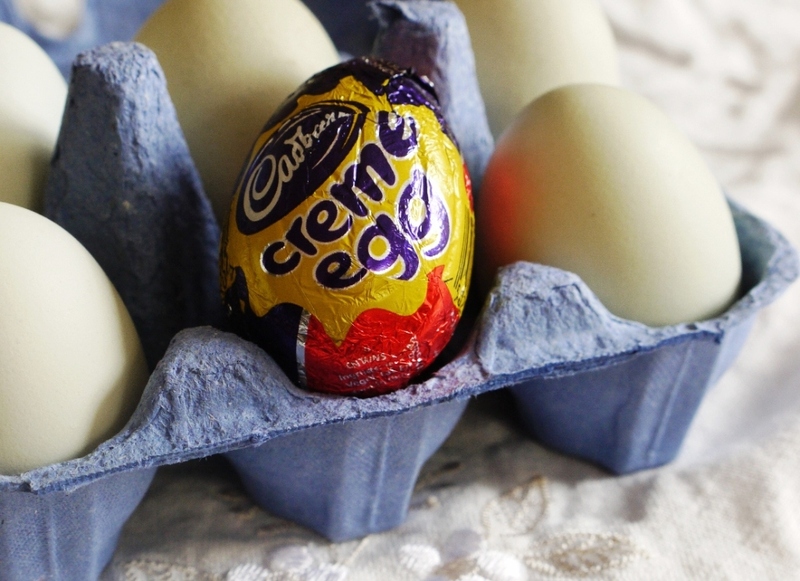 Despite their popularity (300 million of the things are sold every year in the UK), and strong association with all things seasonal (Creme Egg ads are to Easter what Coca Cola ads are to Christmas, sad but true), I’m just not that keen on them. Give me a caramel-filled alternative or handful of Smartie-like Mini Eggs any day over the sickly fondant slop that fills the nation’s favourite Easter egg. That’s not to say I don’t like the idea of them. There’s something about peeling back the foil, biting off the top and licking out that gloopy goo which brings out the child in all of us. This childish joy has been so perfectly captured in the Creme Egg ad campaigns that every year I’ll be tempted to try one, opening it in eager anticipation only to be defeated after a couple of bites by the onset of sugar on top of more sugar. What kind of eggs will you be enjoying this Easter? Although I can’t quite get to grips with the taste of a Creme Egg, I do like the way they look. If you’re a regular reader of this blog you’ll know I like to experiment with chocolate coated ice cream (Salted Caramel Rolo Cups, Butterscotch Pecan Tartufi, Salty Snickers bars and chocolate-coated rhubarb to name a few), and with Easter just around the corner, I began to wonder whether I could create some sort of ice cream-filled egg. Ever since I got an ice cream maker, I’ve wanted to make the flavour fior di latte. Literally translated as ‘flower of milk’ (fleur de lait in French), this ice cream showcases two key ingredients, milk and cream, and is as delicate as its name suggests. Because there’s no vanilla extract or custard base, it’s a sort of dairy version of a sorbet with an incredible, subtly sweet milky taste and a pure, clean white colour. Perfect, in fact, for replicating the pearly white fondant you find within a Creme egg (in looks alone, that is – as described above, the flavour is entirely different). While I’d describe fior di latte’s flavour as elegant, fresh and clean, it also reminds me rather bizarrely of Mr. Whippy, or soft-serve ice cream to those outside the UK. It seems like sacrilege to compare this incredible ice cream with the cheap aerated swirls churned out of ice cream vans all over the country, but there’s something about the lightness of texture and milky taste that really does take me back to the very first time I tasted a 99 Flake. This month, fellow food blogger Kavey’s Bloggers Scream for Ice Cream challenge was to recreate your favourite childhood ice cream experience or flavour. While a 99 Flake is never going to cut it as my all time favourite flavour, there was something so exciting about being bought one from the van as a child, pulling out the flaky stick of chocolate and licking off the sugar-sweet, slightly synthetic ice cream, that it probably deserves a place somewhere in my top ten. It’s the kind of food memory that belongs to a category where nostalgia reigns supreme, flavour forgotten in a haze of sunny afternoons in the park and carefree childhood days. If I ate one nowadays it probably wouldn’t taste the same, so why not try to recreate it in a new and interesting way for my twenty-something palate? The recipe below is therefore my combination of two British favourites, the Cadbury’s Creme Egg and a Mr. Whippy ice cream, taken in a slightly more sophisticated (snobby, who moi?) direction with a delicate fior di latte ice cream and good quality organic milk chocolate (the flake in this equation). The passion fruit pulp is a little bit leftfield, but it works wonderfully with the lightness of the ice cream, the seeds providing crunch against the smooth interior of the egg, and passion fruit and chocolate working together in sweet, sharp harmony. I’d originally intended to freeze a peach flavoured purée into the middle of my eggs, however after reducing down the fruit, what I was left with looked more murky brown than a beautiful bright orange. Still wanting some sort of yolky centre, I stirred a small amount of natural yellow food dye into the centre of half my egg halves before freezing, but left the other half plain, thinking I might be able to do something with them later on. That something is the addition of a small amount of passion fruit pulp and the slightly sour, juicy, crunchy yellow topping turned out to be the perfect partner for this ice cream. If you don’t have time to make your own egg shells, do try this ice cream on its own; it’s simple, clean and the perfect palate cleanser. 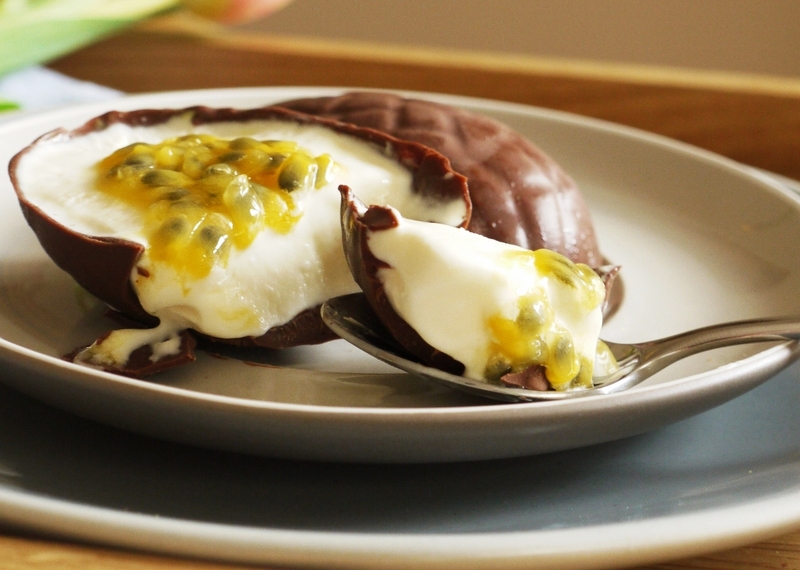 You could also cheat and spoon it into ready made Easter egg shells, or simply serve with a few shavings of milk chocolate and the passion fruit pulp spooned over the top. 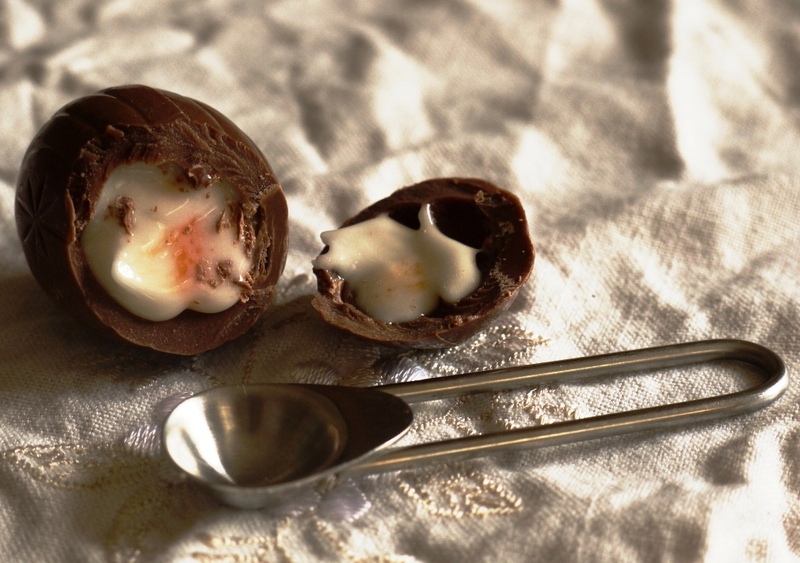 Melt the chocolate in a bain marie and use to coat the insides of your Easter egg moulds. I’ve not provided exact quantities as the size of moulds will vary wildly, but if you do end up with any leftover chocolate I’m sure you can think of what to do with it! Pop your Easter egg moulds in the freezer to harden. For the ice cream, warm the milk, sugar and salt in a medium saucepan. Whisk the cornflour and double cream together, then stir into your warmed milk. Heat the mixture, stirring carefully, until it begins to boil and bubble. Reduce the heat immediately and simmer for approximately two minutes, continuing to stir. It will thicken slightly. Remove from the heat, scrape into a bowl, cover and chill in the fridge for about an hour. Remove, whisk until smooth, then return to the fridge overnight. When ready to make your eggs, churn the ice cream according to your manufacturer’s instructions. Remove your chocolate egg moulds from the freezer. Once the ice cream is churned, spoon into the prepared chocolate moulds, flatten the tops with a palate knife and return to the freezer. If you wanted a dyed yellow middle, now would be the time to add a tiny amount of yellow food colouring to the centre. Remove your eggs from the freezer a couple of minutes before you’re ready to serve. Spoon a little passion fruit pulp over the centre and enjoy! Great work – particularly love that last picture of the whole egg. Reckon people would be surprised and delighted to bite into one of those! This is pure genius. 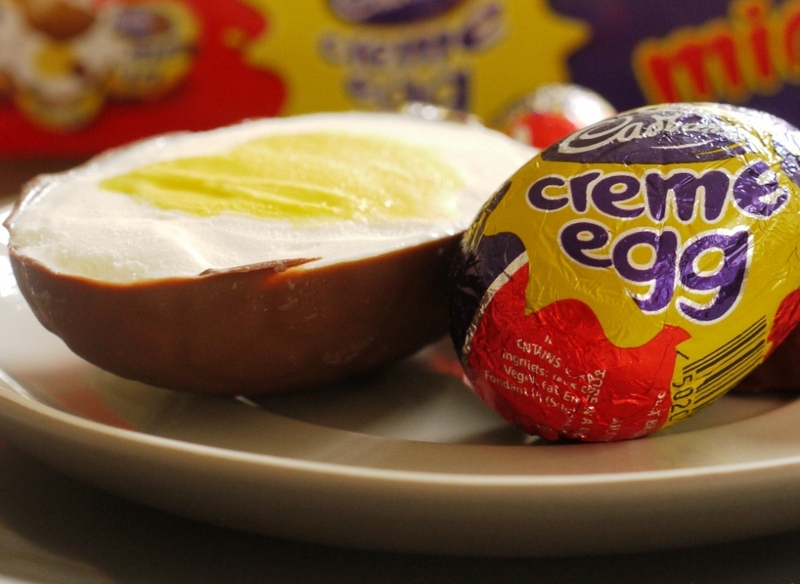 I’ve never actually tried a creme egg but I really hate gooey over-sweet things (like that molten caramel centre inside a caramel dairy milk bar) so the idea kind of disgusts me. The look of this creation, however, does not disgust me. What a great idea! What a clever idea! Love the use of passion fruit too, it’s underused in my opinion. I might just have to try this! Wow, honestly, was worried about your ice cream queen crown for a moment there, having seen the frankly FABULOUS entries people have been making, but now you have me thinking you’re not going to let any pretender have a look in. I’ve loved this month’s ice cream challenge, there have been some amazing treats created but this is definitely up there! 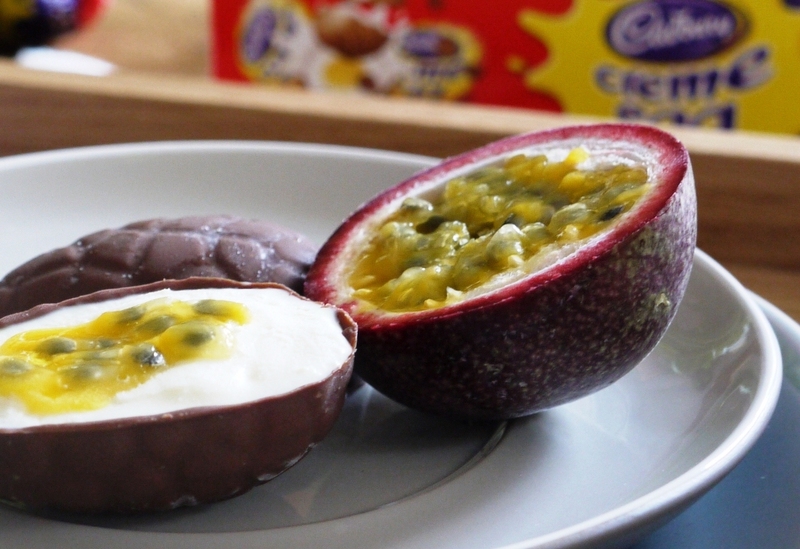 I love passion fruit so this sounds far more appealing to me than a normal creme egg. Elly – I think you have to try one, if only for the sheer shock of all that sugar! Delicio8 – thank you and agree, definitely should use passion fruit more often! Kathryn – thank you, there have been some awesome entries into the challenge this month. This is AMAZING!!! I loooove fior di latte ice cream, and pretty much HATE creme eggs. But, like you, Ive always loved the idea of them – so this is totally a ‘having my ice cream and eating it too’ situation. Now, if only we’d brought my ice cream maker out to the states… argh! What a fabulous idea. I would love to try some right about NOW. I love how perfectly this ice cream looks – you are a creative genius! Your ice cream creations are amazing, and I would definitely prefer your creme egg to a real one. I had some delicious fior di latter ice cream in Palermo, along with a scoop of toasted almond flavour. Heavenly. In Sicily they eat ice cream in a brioche. There’s an idea for you! Em – fior di latte ice cream is absolutely amazing, can’t get enough of the stuff! Euan – I was on holiday in Sicily last August and ice cream brioche was everywhere! It didn’t really appeal to me, but I know it’s something of a local speciality. Looks lovely. The only egg I ever eat at Easter is boiled with salt and pepper, lol. Not much of a chocolate person, but I would happily eat one of those pictured here! I can barely eat one Creme Egg as I find them so sickly. But I could polish several of these off no problem! And so pretty too! I actually visited the Cadbury factory when I studied abroad in London. Honestly, I’m a dark chocolate fan, so most of their products don’t appeal to me. This is inspired!! I love it!! I’m afraid I’m a bit of a sucker for creme eggs this time if year, even if I’d actually prefer a plain bar of chocolate I feel obliged to Easter-up my chocolate cravings with a creme egg. I’m sure this must have tasted heavenly- what a brilliant post! The Aspiring Baker – thank you 🙂 It seems from these comments quite a few people don’t get on with creme eggs. Funny how popular they are in the UK! Jenny – there’s a time and a place for Cadbury’s chocolate, but it’s far from being the best! Kate – haha I know what you mean – I’m the same with mince pies; I don’t really like them, but somehow without them it doesn’t quite feel like Christmas! all I can say is Yes Yes Yes! Wow! It looks sooo damn good! Laura – Creme Eggs always look so incredibly tempting but they’re just too sweet – every year I want one and I never learn my lesson! I was almost literally jumping for joy when I read this! Everyone, I mean EVERYONE, here loves the Cadbury egg. I’m always the outcast. Like you, I see the appeal, but I couldn’t even finish one when I was young. But I could definitely get around yours! I love making ice cream and tartufi (none as beautiful as yours), and The Perfect Scoop is one of my favorite cookbooks. The fior di latte ice cream must be so fresh and clean. These are beautiful! And, I’ve never been a fan of Cadbury Eggs, but these look delicious. Sacha – ah, so pleased you like these! The ice cream on its own is delicious – I’d recommend making a double batch, turning half into eggs and eating the other half straight up! Nic – it’s funny, people seem to either love them or hate them! Hi.. Love Everything.!! Interestingly, I have had a very similar dessert to the ‘Cadbury Creme Eggs’ at a local restaurant . They serve a vanilla panna cotta with a mango purée centre .. Delicious, with toasted brioche ‘soldiers’ to dip. 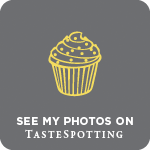 Oi You Food – very tasty indeed! Marilyn – ah, thank you 🙂 That panna cotta sounds delicious – what was the restaurant? Thanks for your comment & so pleased you’re enjoying the blog! So many suggestions about blogging but above all be true to yourself, write what you love & set yourself challenges!